Este documento de 87 páginas de apéndices complementa ENERGY STAR Manual de acción para la pequeña empresa. Mientras que el libro principal da una orientación general sobre cómo implementar un programa de gestión de la energía en su pequeña empresa, estos apéndices toman una inmersión más profunda en temas tales como auditorías de energía, trabajando con contratistas y mejoras. Use this four-page document to find specific advice on how auto dealers can become more energy efficient. This resource is intended to complement and build upon the guidance provided in the ENERGY STAR® Small Business Action Workbook, with a focus on the auto dealer facility type. Auto dealers have unique energy characteristics, including more energy usage per square foot than a typical office building. 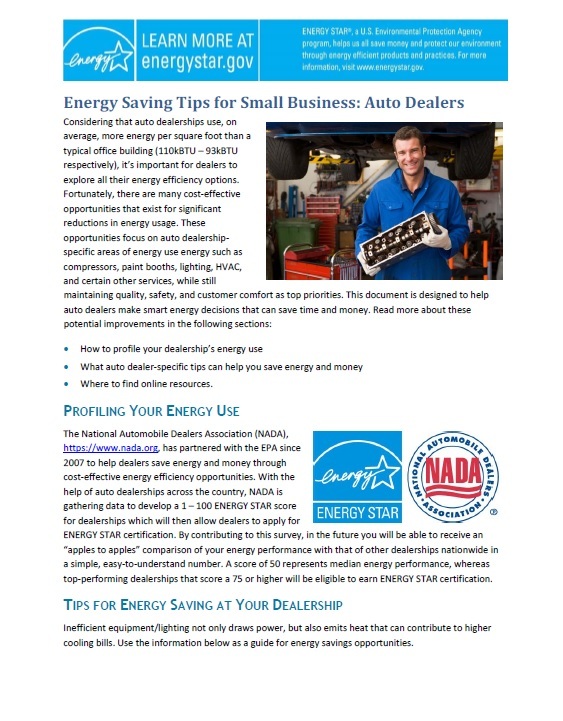 In addition to energy saving tips, Energy Saving Tips for Small Business: Auto Dealers provides guidance on how to profile your energy use and links to additional resources. Use this three-page document to find specific advice on how grocery and convenience stores can become more energy efficient. This resource is intended to complement and build upon the guidance provided in the ENERGY STAR® Small Business Action Workbook, with a focus on the grocery and convenience store facility type. 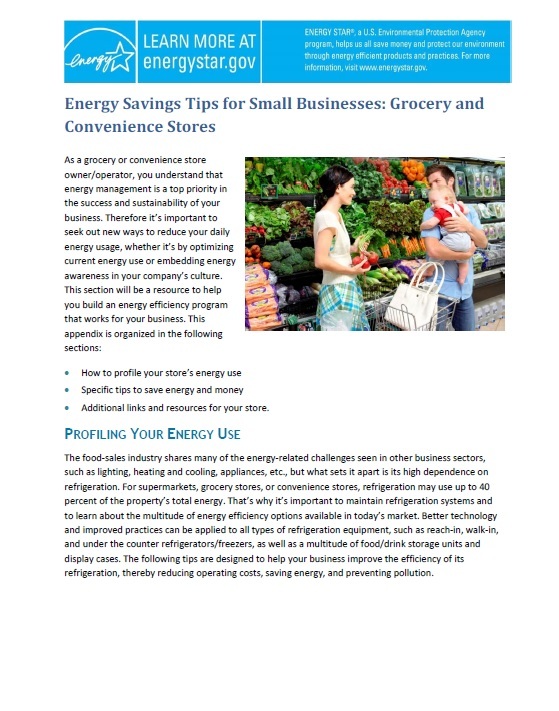 In addition to energy saving tips, Energy Savings Tips for Small Businesses: Grocery and Convenience Stores provides guidance on how to profile your energy use and links to additional resources. 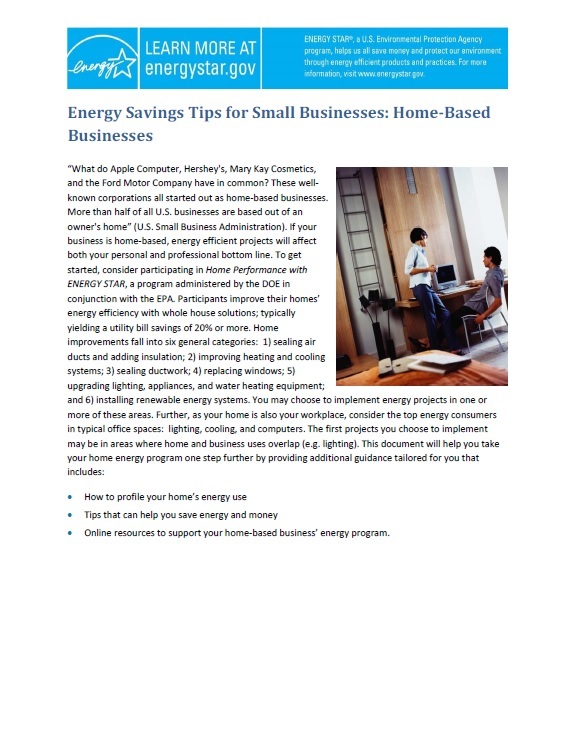 Use this six-page document to find specific advice on how home-based businesses can become more energy efficient. This resource is intended to complement and build upon the guidance provided in the ENERGY STAR® Small Business Action Workbook, with a focus on the home-based business facility type. Use this four-page document to find specific advice on how hotels and motels can become more energy efficient. This resource is intended to complement and build upon the guidance provided in the ENERGY STAR® Small Business Action Workbook, with a focus on the lodging facility type. Hotels and motels have to balance energy efficiency with guest comfort. 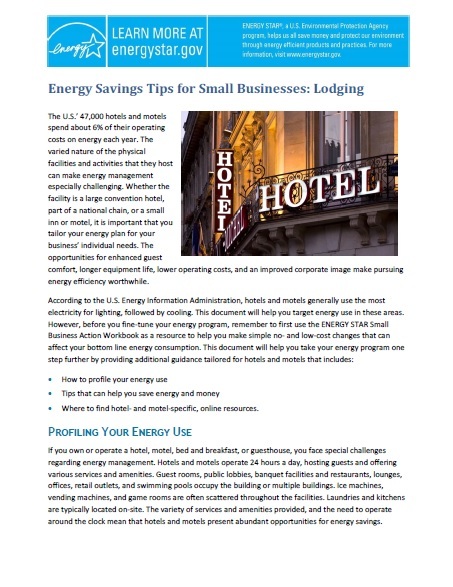 In addition to energy saving tips, Energy Savings Tips for Small Businesses: Lodging provides guidance on how to profile your energy use and links to additional resources. Use this four-page document to find tips on how offices can become more energy efficient. This resource is intended to complement and build upon the guidance provided in the ENERGY STAR® Small Business Action Workbook, with a focus on the office facility type. Use this five-page document to find specific advice on how restaurants can become more energy efficient. 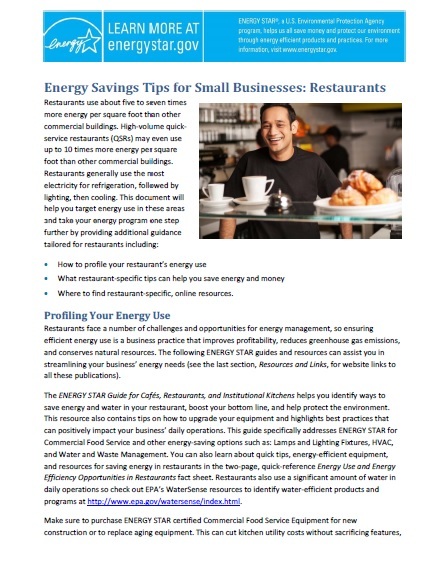 This resource is intended to complement and build upon the guidance provided in the ENERGY STAR® Small Business Action Workbook, with a focus on the restaurant facility type. Use this six-page document to find specific advice on how small and medium manufacturers can become more energy efficient, which is critical for sustaining a successful manufacturing operation. This resource is intended to complement and build upon the guidance provided in the ENERGY STAR® Small Business Action Workbook, with a focus on the small and medium manufacturer facility type. 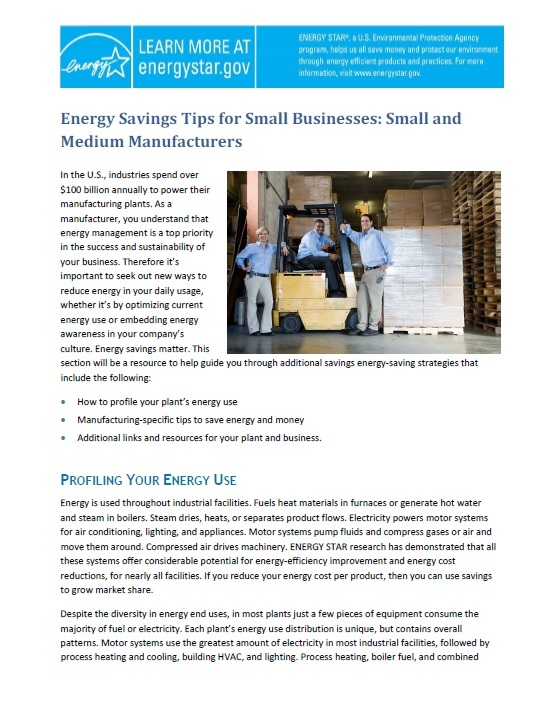 In addition to energy saving tips, Energy Savings Tips for Small Businesses: Small and Medium Manufacturers provides guidance on how to profile your energy use and links to additional resources. 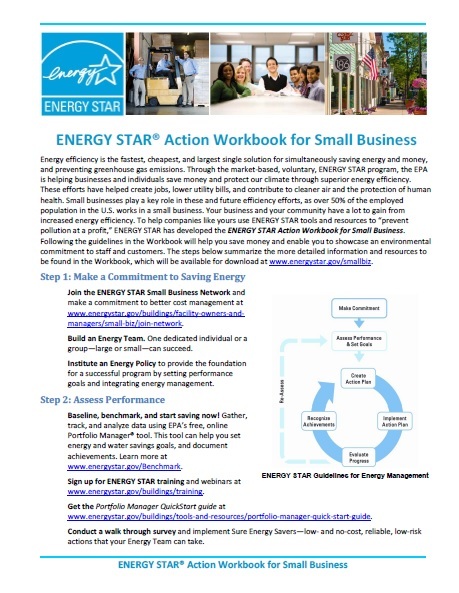 The ENERGY STAR Action Workbook for Small Business is intended to serve as a resource and planning guide for owners, operators, and employees of small businesses. This 36-page guidebook provides step-by-step guidance on ways to increase energy efficiency in facilities by implementing realistic and cost-effective energy improvement projects. 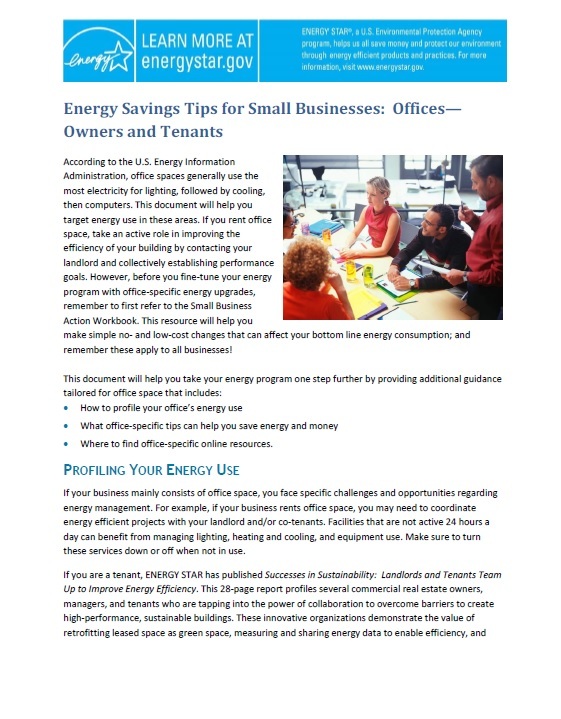 This two-page document summarizes the ENERGY STAR Action Workbook for Small Business and is useful for people who want a high-level overview of the seven-step ENERGY STAR approach to saving energy in your small business. For businesses interested in implementing this approach, we recommend downloading the full ENERGY STAR Action Workbook for Small Business.